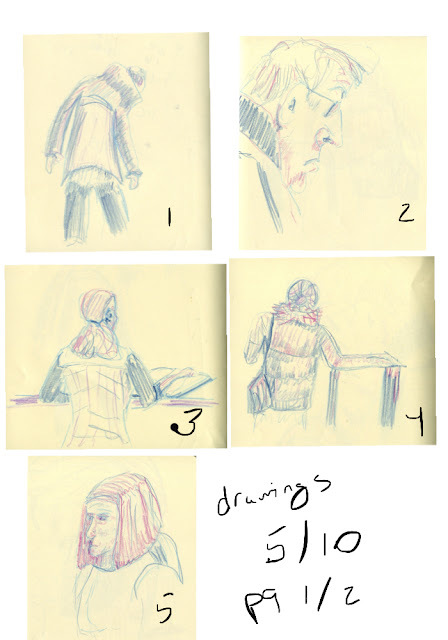 The other day, I headed out into public--the public library, where I drew patrons and workers near the entrance. 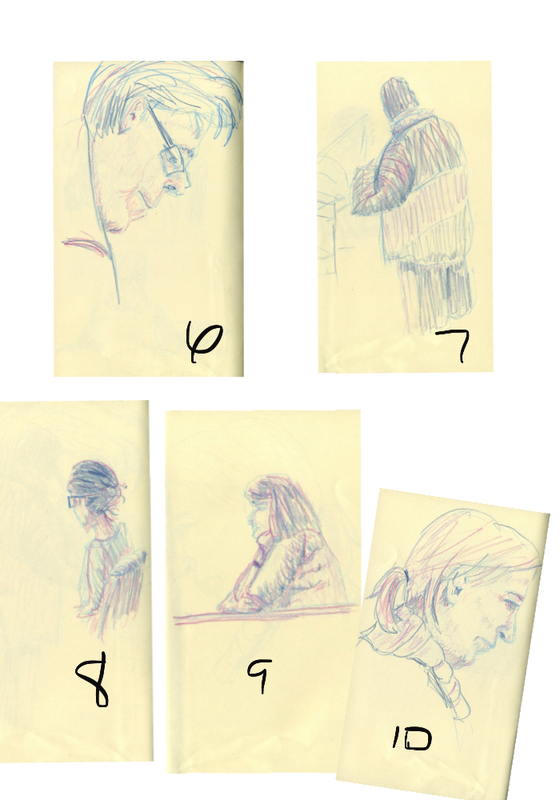 I had a clear task for myself: I wanted to practice scribbling people. Really scribbling. Moving fast. Practicing catching form with speed. 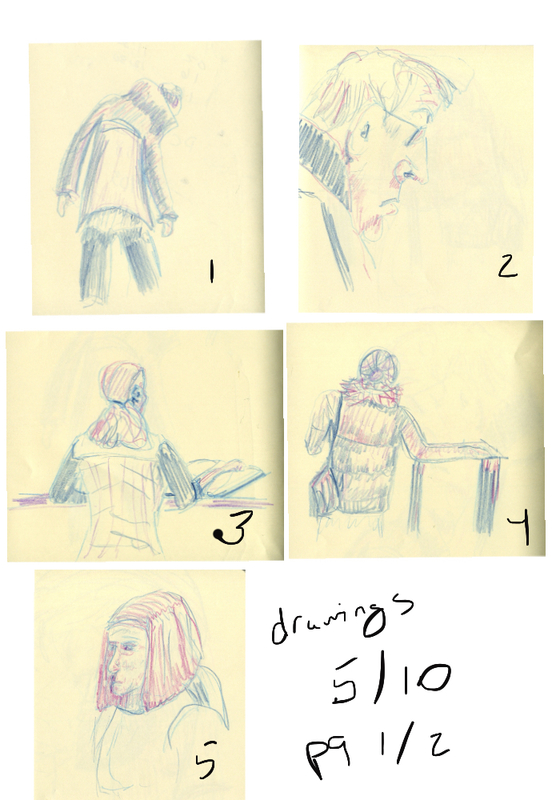 So my goal was ten 3-minute sketches using three (no more) colored pencils. This was a great exercise for me. I had to set a timer to go only three minutes, because I wanted to see what three minutes felt like, how fast it was, and to try to get something fun down and not fuss. There is a wide variety in all of these sketches. I would like to be able to suggest a face using values without having to do details. I've seen this done in sketches with watercolor.... not sure about pen. Shadows laid in to suggest face, not attempting to catch a resemblance, but to convey "person" and perhaps a general sense of appearance or mood. I think my sense is that in my future drawings, I will be focusing on places or scenes where people will be present, but not the focus. I don't want to blow them off. I want to represent them quickly, without detail, but with visual impact. Man, this is some fun stuff. And I am so grateful for the teaching of Roz Stendahl, whose Drawing Practice class led me on this scribbling adventure. If you've never checked out her incredibly educational blog, I recommend it! As the result of the above-mentioned class with Roz, my scribbling output has really increased. So for the month of April, I'm going to test drive the idea of more frequent postings! I'm going to post something every weekday--much of it from this class. Then, come summer (at least here in Michigan), I'm going to rethink scheduling and focus as I go forward.